Author Lorri Ungaretti will guide us through the quick development of the Sunset District from “inaccessible” sand dunes to a city suburb. Her talk is based on her book: Stories in the Sand: San Francisco’s Sunset District, 1847-1964. You can find more about the book, and some more about what we might be learning in this article on SFGate.com. The males arrive first as a Christmas nest, looking to stake a claim on the nests left behind from previous years, waiting for the arrival of their mates. When the females arrive nest building starts, the males presenting sticks to be added to the ever growing nests. This leads into the courtship, and eventually mating. The eggs are small, only slightly bigger than chickens eggs, but the nestlings that hatch quickly begin to grow. The mother and father bring food to the nest, but don’t necessarily feed the chicks through regurgitation. Great Blue Herons not only snack upon fish, they also hunt gophers and other rodents that populate our parks. Not much preys upon Great Blue Herons in turn although Great Horned Owls have been known to hunt them at times. There are 4 nests currently being used on the tree, but there is about 6 total. The most prized on is near the top of the tree, of enormous size as it has just been added to over the years. One nest fell off the tree at one point — which has since ended up at Audubon Canyon Ranch. The young herons sitting in the nest are wonderfully silly to behold sporting black mohawks that get tossed about in the end. The birds quickly grow though and it is only some weeks before they are nearly as tall as their parents and are stretching their wings, and beginning to hop from branch to branch. After the birds fledge, the birds go they own way. The juvenile young herons at this point are on their own. Parents don’t teach the young. Their survival rate is very low. 67% don’t make it past their first year. You have a couple more weeks to be able to see the birds with the aide of Nancy and her crack crew of volunteers and great spotting scopes. At 1030am she walks her guest around (young kids are free, adults are $10) the lake and over to the Strawberry hill, looking at not only the herons, but with an eye for the other nests and species that inhabit the park. 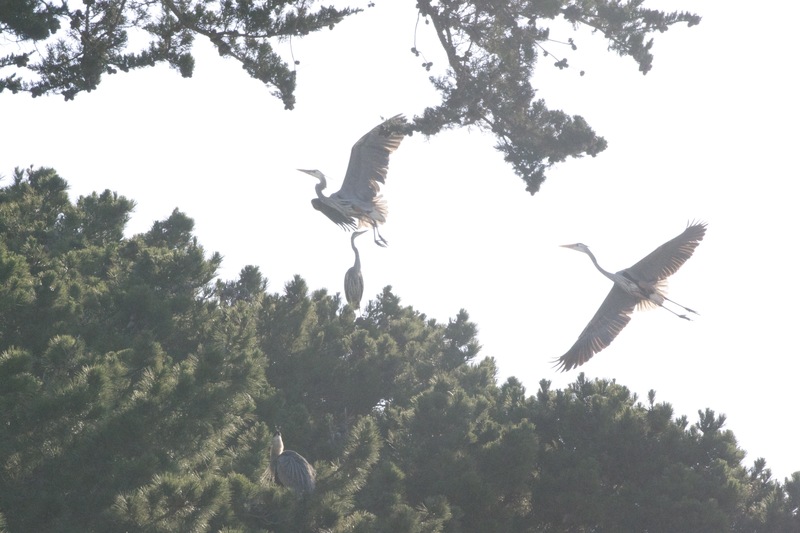 It’s well worth a trip — head over to the Stow Lake boathouse, and look for Great Blue Heron signs.